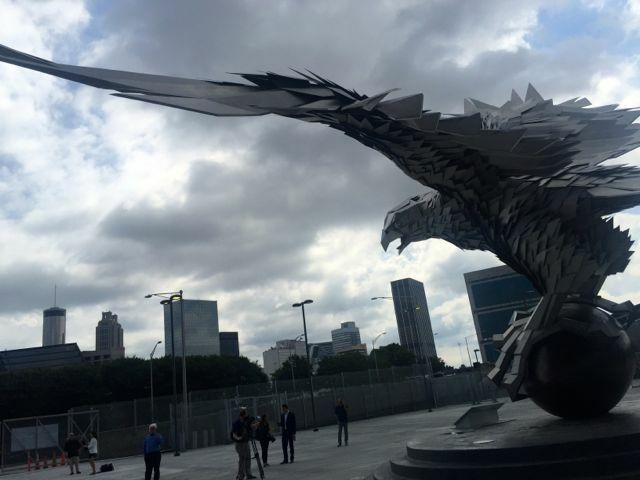 As you walk up to it, the striking angular architecture of Atlanta’s Mercedes-Benz Stadium is a way of telling you, before you even set foot inside, that this building is different from any other stadium you may know. When you get inside, see the eight-petal roof and the circular video “halo board” right below it, those feelings are confirmed. Deeper inside the venue’s construction, the theme is continued with the building’s network technology, which is similarly different if less easily seen. 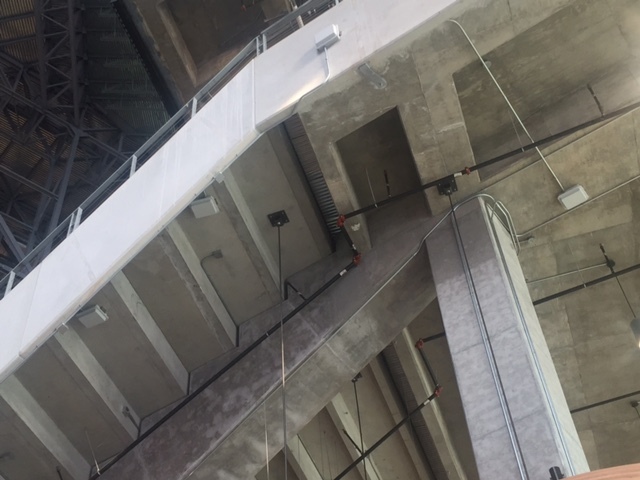 With more fiber optical cabling than perhaps any comparable stadium, the new home of the NFL’s Atlanta Falcons is built more with an eye toward what comes next, while also debuting with systems built with the peak of current knowledge and deployment designs. Unlike the owners and operators of some other new arenas, the Falcons’ aren’t wasting much bandwidth trying to paint Mercedes-Benz Stadium as the best-ever when it comes to stadium technology. (In fact the stadium network crew is being very closed-mouth about everything, not providing any game-day statistics even though informed rumors tell us that the Wi-Fi network is doing very well.) But come back in 5 years, or even 10 years from now, and see if the decisions made here were able to consistently keep the Falcons’ new roost at the top of the stadium-technology game. Editor’s note: This profile is an excerpt from our latest STADIUM TECH REPORT, our Fall 2017 issue that has in-depth profiles of network deployments at Notre Dame Stadium, Colorado State’s new stadium, and the Los Angeles Coliseum. DOWNLOAD YOUR FREE COPY of the report today! What’s working now, as the venue enters the Falcons’ 2017 NFL season, includes a Wi-Fi network built with nearly 1,800 Aruba access points. 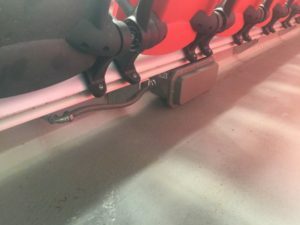 Of the 1,000 of those installed in the main seating bowl, most are mounted underneath the seats, a trend that gained steam a couple years ago and now has numerous proof points behind the higher capacity and faster performance of so-called “proximate” networks. There’s also a neutral-host distributed antenna system, or DAS, for enhanced cellular coverage, built and owned by the arena with space rented out to all four of the major U.S. cellular carriers. And then there’s the halo board, the circular or oval-shaped video screen that circumnavigates the roof right at the base of the also-innovative eight-petal roof, which is designed to open or close in seven minutes or less. 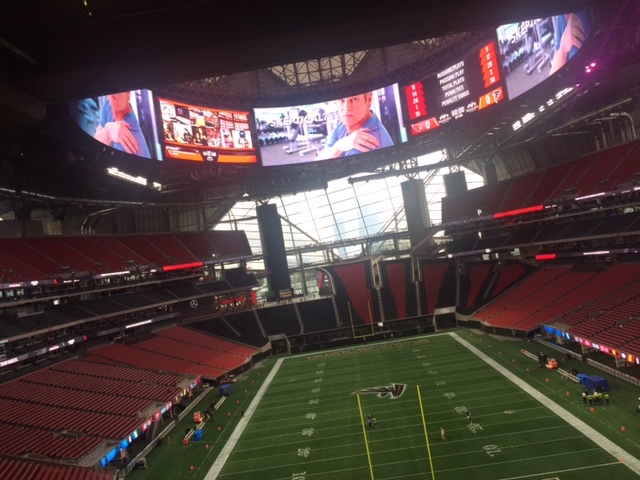 If big video screens are a never-ending trend the Falcons are right out in front with their offerings at Mercedes-Benz Stadium, starting with the halo board and the “mega-column,” a hundred-foot high vertical screen just inside the main entryway. The 2,000-plus other regular-sized screens scattered around the venue should ensure there’s always a display visible, no matter where guests are looking. And while the team has future plans for video, the one piece of network technology that may matter most is the optical fiber, which can support wider bandwidth and faster speeds than traditional copper cabling. The statistic thrown around often in the Mercedes-Benz Stadium press materials — nearly 4,000 miles of fiber used — is meaningless to most who repeat it, other than it seems like a lot of glass wiring. What’s more interesting from a stadium-design perspective is not exactly the total but instead the reach of the fiber, as the network designers pushed fiber out to the edges much further than before, betting that by putting more capacity farther into the reaches of the stadium, there will be less needs for big-time network upgrades in the future, when the inevitable need for more bandwidth arrives. 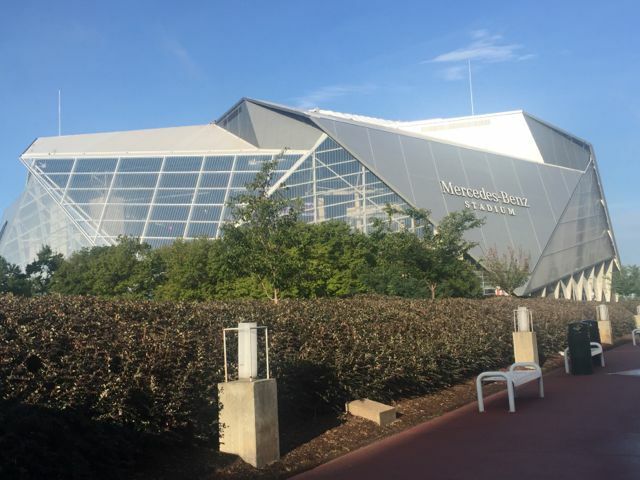 In picking IBM as its lead networking technology partner, the Falcons most certainly gleaned a lot of their stadium network design lessons from the 2015 deployment of a new Wi-Fi network at Texas A&M’s Kyle Field, a project also led by IBM. Making deep use of Corning fiber networking technology, A&M’s Wi-Fi network hit the ground running hard, as a big number of under-seat APs supported several big days of data use by the 100,000-plus Aggie fans who filled the building on home-game weekends. The basic idea behind using fiber is that optical cabling can carry far more bandwidth at faster speeds than a comparable copper wire. 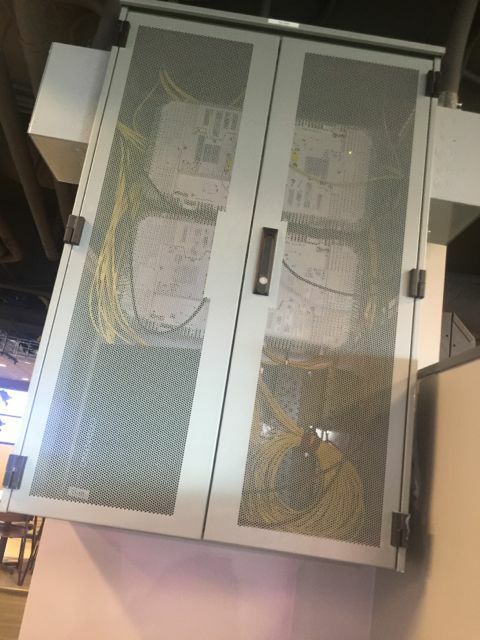 By putting more fiber farther out into all reaches of a stadium, a network can be “future proofed” by being able to support many more new devices on the end of each fiber strand. By not having to string new cabling everywhere to support greater demand, a stadium will theoretically spend far less money in the long haul. From a network backbone perspective, the Falcons took what Texas A&M did and pushed even farther with fiber, taking the glass circuits as close to the edge devices (mainly Wi-Fi APs) as possible. 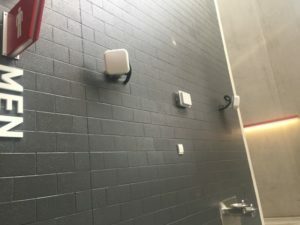 In our mid-August press tour at Mercedes-Benz Stadium, we saw many of the so-called “mini-IDFs,” small closets with three or four pieces of gear in them, mounted on walls throughout the stadium. If there is one big drawback to using fiber, it has to do with the intricacies of dealing with the construction end of building fiber networks, since the cables need to be precisely cut and joined, often with highly specialized equipment. There are also far more network technicians who are trained in copper wiring deployments than in fiber, so personnel issues can also increase costs and complexity. 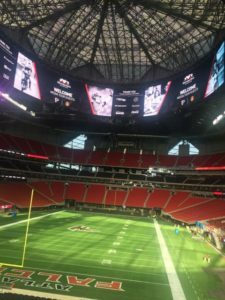 On the eve of the Falcons’ first regular-season home game, a mid-September playoff rematch with the Green Bay Packers, Miller and his crew had not yet provided any traffic or network throughput statistics from the preseason games at Mercedes-Benz Stadium. However, some inside sources told MSR that the Wi-Fi traffic during the preseason and the early September college game was at the top range of what has been historically seen for NFL game days, so it appears that the system is ready to go. 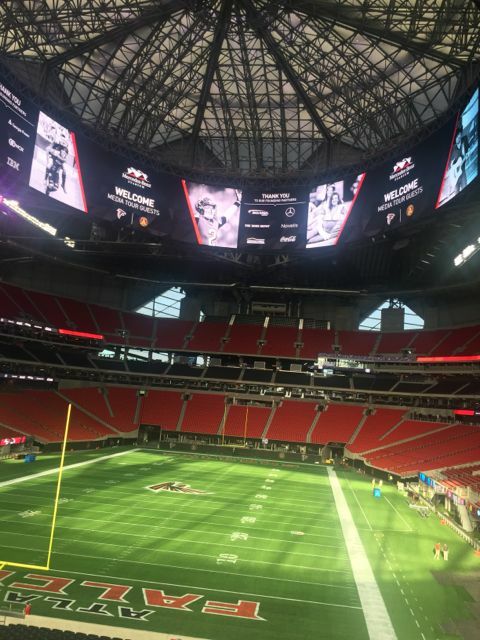 Though it may be hard for any other stadium to top the halo board for a while, on some other technology-related items the Falcons and Mercedes-Benz Stadium are taking a step back and not pushing digital solutions to where they might not be needed. On the stadium app side, for instance, the IBM-developed application does not support some services seen at other NFL or pro-league stadiums, like “blue dot” wayfinding or in-seat food delivery or even express pickup for concessions. Instead, the app uses wayfinding based on static maps, where you need to put in both a location and a desired destination; and on the food-ordering side, fans can enter in an order and their credit card information, but must then take it to a stand to be scanned and fulfilled. And while the Falcons’ new app does have a fun FAQ chatbot called “Ask Arthur” (for the team’s owner, Arthur Blank), there won’t be any live instant replay features in the app. With all the video screens in the stadium, the Falcons think they have the replay angle thing covered. The Falcons will use the app, however, for expanded digital-ticketing features as well as to help fans find and pay for parking. On the concessions side, the Falcons’ well-reported “fan friendly” pricing with low costs for most stadium food staples might prove more interesting to fans than being able to have food delivered. Miller was also adamant that fans won’t see any portal or other marketing messages between finding and connecting to the Wi-Fi network.